Actually, giving thanks to God is something we should do all the time. Paul says in 1 Thessalonians 5:18 to give thanks in every circumstance. This, along with prayer and rejoicing in the Lord, is what God wills us to do. 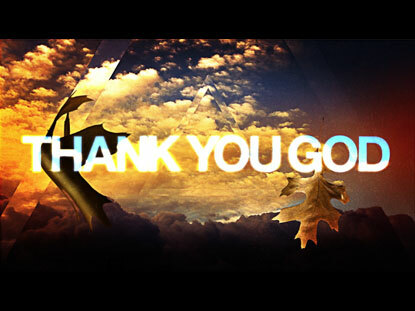 So we don’t need a special day to thank God; it should be part of what we do every day and many times during each day. But Friday is a good time to “collect” our thanksgivings. Because it’s at the end of the work week, we can look back and remember the faithfulness of God for the entire week. I don’t know about you, but when I hit the weekend it’s like pushing the “reset” button on my mind – I forget what I did during the week because I’m engaged in the weekend. So Friday is as good a time as any to remember the good things God has done. 1. Did God bring someone new to you this past week? Did you deepen a relationship? Is there someone you are really thankful for? 2. Did God give you strength to accomplish difficult tasks this week? Was there a time when you saw “fruitfulness” in your work? Did someone affirm or encourage you for something you did? 3. Did God give you a prompting that you followed up on? Did He speak to your heart about something? Did He draw you closely to Himself through prayer or personal worship? 4. Did God teach you something new this week? Did He speak to you through Scripture, a Christian author? Did you apply some new spiritual insight? Did following a Biblical principal this week protect you or bless you or bless someone else? 5. Did God give you opportunities to serve and love others this week? Did you sense the joy of serving? Did you get to use your spiritual gift or special ability to bless another person or make a situation better? 6. Did God give you a pleasant memory this week? An unexpected blessing? An email encouragement? A blog that really spoke to you? (Ok, I confess I’m guilty of manipulation!) Something that lifted your spirit when you felt down? 7. Did God teach you something through a trial? Are you finding grace in unexpected places through a hardship? Is your soul expanding toward God and others because of difficulties you’ve endured? 8. Is there something you normally take for granted that you realize now is a great blessing? (like breathing, eating, taking a hot shower, driving a car) Did you notice something in everyday life that is amazing (like watching a hummingbird gather nectar from a flower)? Bring it with you when you go to worship with your church – and get there a little early. Before the service starts, take out your little “Thank God Friday” list and use it to give God an intentional, well-thought out sacrifice of thanksgiving. And see if that doesn’t “jump start” your worship of God! Don’t just “Thank God it’s Friday”; but make today a “Thank God Friday”! Thank you for this foundational reminder, Doug. I remember studying Exodus or Deuteronomy with you before and we discovered through a cycle of repetitions in one of the chapters that the lack of thankfulness in the heart begins the path that ultimately leads to sinning. It did not say that we sin only when we are not thankful, but that there is a tendency to begin a cycle that leads us away from God and into sin when we lack a thankful heart. And we further discovered that to better equip us from sliding away from God, was to practice purposeful reflection on the things from God for which to be thankful like your blog is reminding us to do. I have discovered this to be very true in my daily walk with God. When I stop that purposeful reflection of thanksgiving, I more easily fall into temptation and sin. But when I keep the thanksgiving active in my heart, I have a stronger faith and walk with God. So, thank you for this great reminder and all the detailed questions that helped me get through the sludge in the brain that allowed me to remember the details of the week in order to give God thanks. Thank you, Doug, and thank you, Jesus! This was a great exercise for me! As I reflect back at this week I am amazed by how much God has blessed, taught, protected, encouraged me. And it was just 1 week!!! Actually it was just since Monday. My heart just wants to keep praising God & thanking Him. It’s nice to have this attitude going into the weekend instead of anxiety & a complaining mindset. Now I know get why God asked the Israelites to remember what He did for them, it helps you to trust Him for the future rather than worry in the present. Thanks for sharing! !